We designed our Challenge Course with a very specific set of goals in mind. We wanted groups and individuals to have fun while using problem solving skills and learning team building in a safe environment. 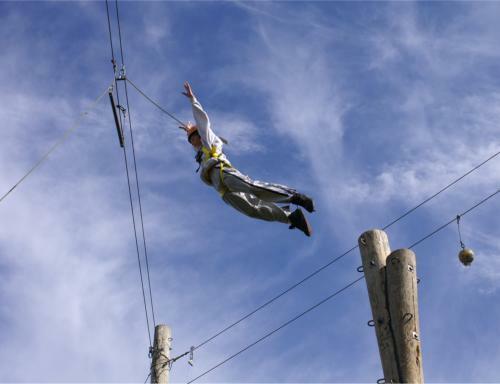 There are two ways to experience the Upward Enterprises’ Challenge Course. The recreational program is all about fun and enjoyment, but the educational program focusses on Maryland team building, communication and trust. The Upward Enterprises facilitator sequences activities to inspire in-depth processing of the group experience. 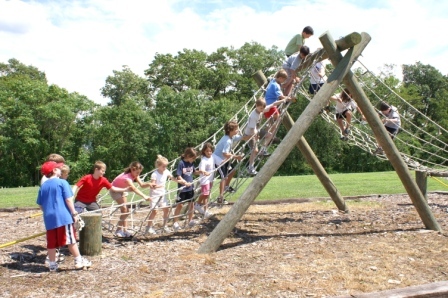 Some are quick team building activities and other are designed to challenge the group as a whole. It’s not called a Challenge Course because it’s easy. It’s meant to bring the group together in a common goal of motivation and camaraderie. The Upward Enterprises site in Buckeystown, MD has more than 80 unique low and high challenge course elements that test groups in different ways. Everything from problem solving games to communications activities. Your group could soar through the air on a 600-foot zipline through the trees. There’s an obstacle course that will challenge your team and bring them together. There’s a 50-foot climbing and repelling that will be fun for some and scary for others. This is only a small fraction of the elements we have for your Maryland corporate team building event. Upward Enterprises is only an hour away from major urban areas such the Washington D.C. metro area; Baltimore, MD; Hagerstown, MD; and Richmond, VA. If you’re looking for a way to motivate and bring your workers closer together, then consider our Maryland team building activities. We even have portable activities that we can bring to you. No matter how big or how small, Upward Enterprises can accommodate you. We are adept at large corporate gathering and retreats and the couple’s experience for an anniversary or just a fun afternoon. Whatever the group, we guarantee an unforgettable adventure that brings them closer together. 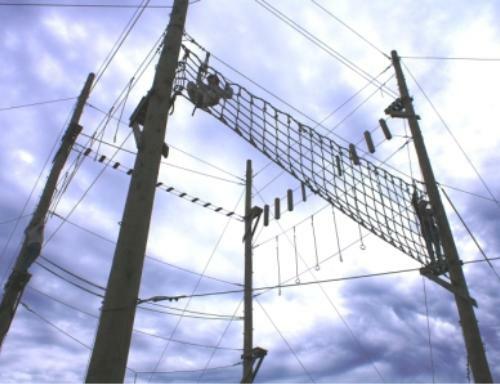 The Static tower is made up of four 50ft poles connected by different activities including a cargo net, swinging tires, ladders and rope swings on three different levels. Even the most adventurous of people will find a challenge here. A simple element like a cargo net gets a whole different perspective at 40' in the air! Our 600ft long zip line through the trees is great fun for all ages! 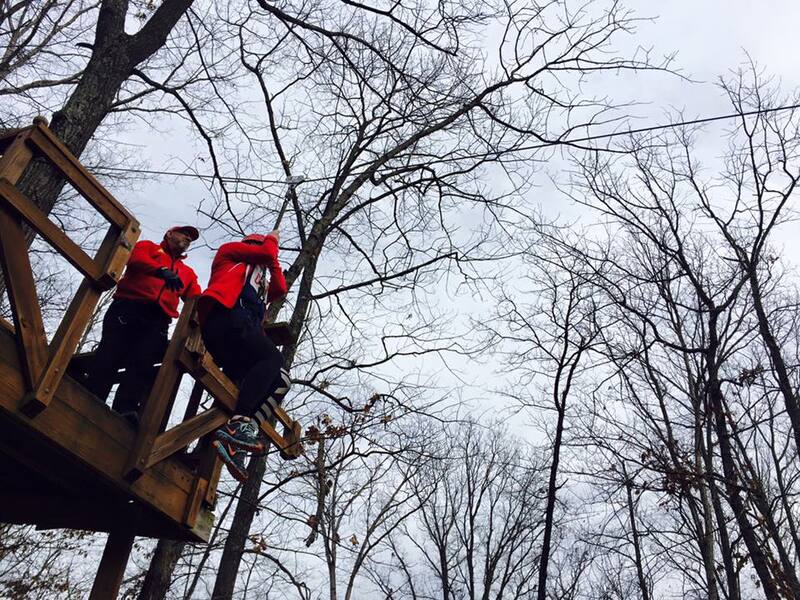 For even more fun, ride the full circuit of the zip line canopy tour at our ropes course in Frederick Maryland. Adventure awaits you in the tree tops as you zip and traverse between the canopy. Our Obstacle Course includes a variety of low activities including the swinging step and commando crawl and ‘A’ frame cargo net. Great activities to get the day started for any type of group team building.